We picked this one up at a book fair recently, and it turned out to be a gem. Lovell teaches Chinese history at Cambridge University. 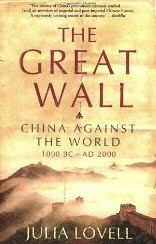 She's a terrific writer, and uses the Great Wall to write a nice history of China and it's relations with other countries. What grabbed my attention first was the story of Albion football team going over to China in the 1970s and refusing to visit The Wall on the principle that, "Once you've seen one wall, you've seen them all." Brilliant. Then Lovell dives into the real history of the wall. First, she says there is no Great Wall of China. It's a collection of walls built at different times by different people. She also delves into Chinese perceptions of wall projects through the ages. Lovell's research is thorough, and her writing lively and interesting. This is a terrific read. It's taught me tons about Chinese history and culture, and I'm looking out for her other books. Excellent timing! I'm in the mood for a history read. I'll look for this one. Thanks! Hmm looks really an interesting book! I love history but ugh... China! China's people eat everything with four legs except a table! ;) I have more in common with the Giant Panda than with the people of China! ;) My ancestors probably came from the muddy banks of the Huanghe River but I feel no affinity with them and no desire to visit China.